Bentley Continental GTC | What Car? 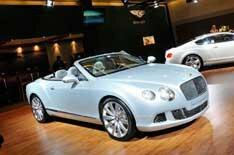 Bentley is showing off its new Continental GTC at the LA Auto Show. The coupe received a range of updates last year, so now it's time for the open-top to get a similar treatment. The twin-turbo 6.0-litre W12's power and flexibility have been upped a little and the standard six-speed automatic 'box has also been tinkered with for faster gearchanges. It also gets the same suspension and steering changes to sharpen up the drive, and the four-wheel-drive system has also been improved to add to the effect. Weight has also dropped, making the GTC quicker and more fuel-efficient than its predecessor.